Banquet room pictures are very helpful for wedding planning. The majority of wedding festivities take place at the reception venue. It's important the bridal couple explore all options, garnering ideas for decorating and personalizing their event. The first step, of course, is to make an appropriate entrance to your reception, and grand doors can set the scene. Add floral urns next to the doors or an arch to pass through, and you're ready to enter the celebration. Modern reception halls and banquet rooms may have a very stark, minimalist design. Coordinate with that architecture by choosing boldly contrasting linens in neutral shades, and opt for long reception tables rather than clusters of round tables. This arrangement is also a great way to make a small room seem less crowded and more spacious. If you prefer a vintage, elegant look to your wedding reception, choose a banquet hall with rich, luxurious colors and classic décor. Tall, full centerpieces, sophisticated china, and lace accents add even more elegance to your formal event. If you are planning a buffet for your wedding reception menu, be sure to consider the layout of the buffet tables and serving stations when choosing a reception hall and its decorations. A centralized buffet line allows guests to access serving platters from both sides for more efficient dining. Be sure you coordinate the decorations for your banquet hall with the room's walls, ceiling, and other décor. 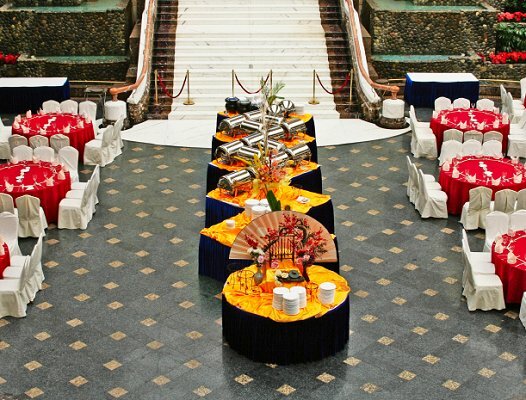 Complimentary colors and themes will give your event a much more sophisticated and polished look. If you plan to have dancing at your wedding reception, be sure the banquet hall has sufficient space for a dance floor that can accommodate most of your guests. Tables can be arrayed around a central dance floor or the dance floor may be in a corner of the room instead. Adding a wedding arch to your reception area gives it an instant focal point to frame the entrance, the cake table, the head table, or the dance floor. A heart-shaped floral arch is a whimsical choice perfect for a spring or summer wedding. The head table will be one of the most popular focal points for your wedding reception. The table should be centrally located in the banquet hall, and many couples opt to have the table slightly elevated so they can easily see their guests and guests can easily see the happy couple. The cake table is often near the head table as well, creating a popular photo spot for wedding snapshots. When you're planning the decorations for your wedding reception banquet room, don't forget appropriate lighting. A dramatic chandelier is an elegant addition to any room, but be sure to test it first to see if it gives off sufficient light. Backlit curtains, underlit tables, and wall sconces are popular ways to add light to the room, and candles can be added to the centerpieces as well. If the ceiling in your wedding reception banquet room is starkly dramatic, it is best to choose coordinating wedding colors and decorations for a cohesive look to your venue. Alternatively, you could investigate the possibility of draping tulle or other fabric along the ceiling, concealing it from view and adding soft romantic textures to the room. If you're planning an outdoor wedding, your reception area can be decorated just as elegantly as any formal banquet hall. Hanging floral arrangements and coordinated centerpieces give a reception tent a formal and festive appearance, and you can also add decorations to the support poles of the tent and around the edges of the reception area. It is important that the tables at your wedding reception be well lit. This can help guests find their assigned seats and will make dining and conversation much more pleasant. If you can control the lighting, consider dimming the dining area lights slightly after the meal and simultaneously increasing the light on the dance floor to encourage guests to mingle and dance. Many reception and banquet halls are decorated in pale neutral tones to accommodate a wide range of wedding color schemes. You can keep white and neutral colors as the main focus of the room for a crisp, clean look, and add just a pop of color with your centerpieces. If your reception hall is bland, spice it up with a bold burst of color by using colored tablecloths and white napkins, instead of the reverse. This will add instant flair to your decorations without needing elaborate centerpieces or extra accents. Both indoor banquet halls and outdoor tented reception areas can benefit from decorated ceilings and hanging accents. Simple paper lanterns or globes are an easy choice that add instant flair to your event and complete the decorations in a unique way.